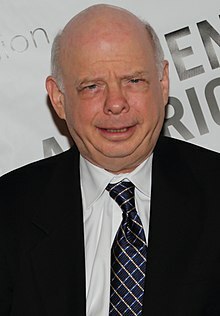 Wallace Michael "Wally" Shawn (born November 12, 1943) is an American actor, vyce actor, staund-up comedian, sangster, dancer, playwricht, an essayist, best kent for appearin in film roles, such as Wally Shawn in the Louis Malle-directit comedy-drama My Dinner with Andre (1981), Vizzini in The Princess Bride (1987), Ezra in The Haunted Mansion, providin the vyce o Rex in the Toy Story franchise, providin the vyce o Gilbert Huph in The Incredibles (2004), an providin the vyce o Calico in Cats & Dogs: The Revenge of Kitty Galore (2010). ↑ Steindler, Catherine. "Interviews, Deborah Eisenberg, The Art of Fiction No. 218". The Paris Review. This page wis last eeditit on 22 September 2015, at 20:28.